2009. L.A. Riverfront Park, Los Angeles. Photographed by Robert Wedemeyer. Images courtesy of John O'Brien. 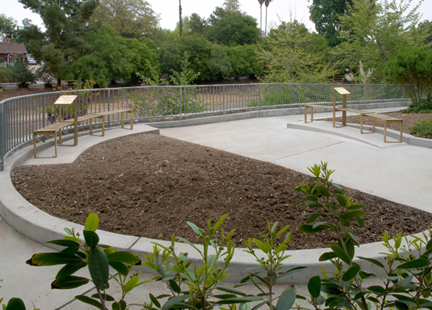 Brass (etched and jet-cut) and stainless steel works, sited in landscaped park. The work consists of sculptures that take the form of podiums and lecterns. Each is topped by a framing device, like those used during the Renaissance, for drawing from nature. 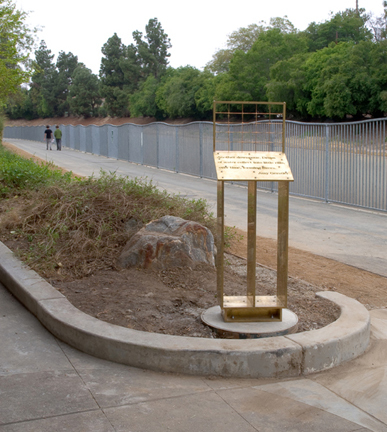 Each is also adorned with poetry fragments, culled from poems about the Los Angeles River.